You may receive updates from International Labor Rights Forum, the creator of this letter campaign. Fyffes is one of the largest fruit companies in the world and the largest supplier of melons (sold under the SOL label) to the U.S. market. Workers on their melon plantations in southern Honduras suffer from job insecurity, poverty wages, inhumane working conditions, gender-based discrimination and denial of healthcare and social security. 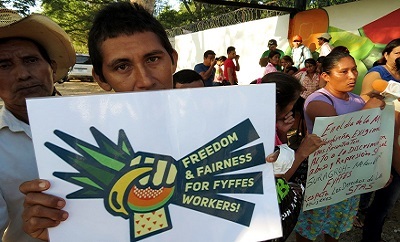 When workers organized a union in January 2016 (STAS, Honduran Agricultural Workers Union) to better their working conditions, they were met with a violent anti-union campaign from Fyffes’ local management. Union members have been subject to blacklists, intimidation, threats, bribes and scores of illegal firings that continue to this day. End discrimination and the anti-union campaign against STAS’ union members by local management. Rehire union members and engage in collective bargaining with STAS, according to the January 11, 2019, agreement Fyffes signed with STAS. We know that Fyffes will only listen when its consumers demand action. Send an email to Sumitomo, Fyffes’ owners, to demand they respect universal human and labor rights!